Welcome to the Lake View Ranch! This cabin has a remarkable view of the property and pond. The ranch is tucked in the woods but is also located near the lodge and pond area. 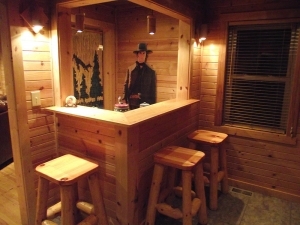 The ranch is decorated similar to lodge in a western theme. 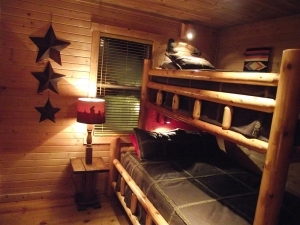 The cabin will sleep 8 and has 3 private bedrooms and 2 full baths and 2½ baths. 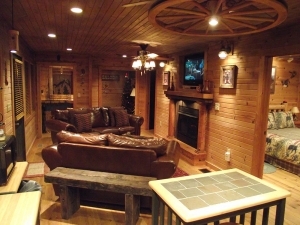 This cabin also offers a game room with bar area and darts. Lake View Ranch is perfect for 3 couples or a small to medium size family. 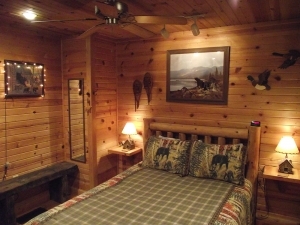 Two of the bedrooms have queen size log beds and the third bedroom has a full size log bed on bottom and twin on top. The ranch is equipped with fireplace, hot tub, TV/ DVD player, Direct TV, central air and heat, fully equipped kitchen, linens, dining room, 3 bedrooms, 2 full baths, 2½ baths, 3 decks, gas grill, picnic table, hammock, and a fire pit with cooking grate. 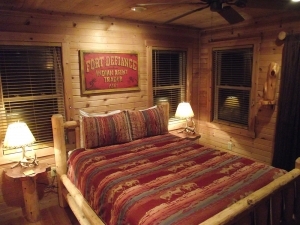 This cabin is very cozy and perfect for couples or families.